FP006 - A/C Delete Panel, Aluminum. BMR Suspension components are proudly hand Made In USA by American workers in our manufacturing facility near Tampa, Florida. We cut, bend, notch, drill, weld, mill, powder coat and package all our high quality performance components from American-made DOM and Chrome-Molly steel. Since race cars don't need heat or air conditioning and deleting the entire AC system can save almost 100 pounds, this is a no-brainer modification. BMR's A/C delete panel and heater delete panels are an easy solution to the large hole left in the firewall once the A/C has been removed. Made from 1/8 aluminum to keep the product lightweight yet not flexible. Patterned after the OE boxes and precision laser cut to bolt on using existing mounting holes. These are available in RED or BLACK HAMMERTONE powder coat. 1964 - 1967 Buick Grand Sport 1964 - 1967 Buick Skylark 1964 - 1967 Chevy El Camino 1964 - 1967 Chevy Chevelle 1964 - 1967 Chevy Malibu 1964 - 1967 Chevy Monte Carlo 1964 - 1967 Oldsmobile Cutlass 1964 - 1967 Oldsmobile 442 1964 - 1967 Pontiac LeMans 1964 - 1967 Pontiac GTO Please see the "Compatibility" link at the top of the listing. Proudly Made in USA By American Workers! Please wait until we send you an invoice before you pay! When BMR began back in 1998, it was difficult for performance automotive consumers to find suspension products that had an innovative design, quality construction, and an affordable price. BMR turned this market void into a business philosophy and has been serving our customer's needs ever since. BMR Suspension products are proudly made in our manufacturing facility near Tampa. We cut, bend, notch, drill, and mill our tubular components from American-made DOM and chrome-moly steel. Every product is fixture-welded to maintain consistent quality. We bead-blast our parts and then powdercoat them on our own powdercoating line. Then we assemble and package the products in our assembly department. By manufacturing our products in house, BMR can control the quality at every stage of the manufacturing process. BMR Suspension products fit and work so well because they are street driven and track tested on BMR project vehicles. Our past project cars include a 2005 Mustang drag car, a 2004 GTO, a 2005 Mustang street car, and a 1994 Camaro. Our current project vehicles include a 2010 Camaro, 2011 Mustang, and a 1969 Camaro. As if that were not enough, BMR also has a 2009 G8 GT, 1970-1/2 Camaro, 1968 GTO, 1970 Chevelle, 1998 Camaro, and a 2000 Grand Prix GTP. But it is more than just great vehicles - virtually every BMR employee is a racer or hot rodder as well. This love of racing is demonstrated every day in our customer service, design innovation, and manufacturing quality. By continuing to push the envelope in product design innovation and manufacturing technology, you can be sure that BMR Suspension will continue to offer the most innovative, quality-oriented, affordable suspension products available. BMR product applications are warranted to be free from defects in material and workmanship under normal use and service for a period of (2) two years from the date of sale to the original purchaser. BMR product is designed to be used with OEM product and other BMR products. This applies to suspension products from other manufacturers as well as aftermarket exhaust products, aftermarket drivetrain products, and other aftermarket products. The right to make changes in the design or add to or improve on their product without incurring any obligation to install the same on products previously manufactured is expressly reserved. 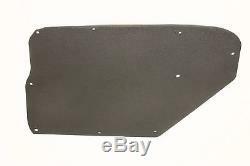 The item "BMR Suspension FP006H, A/C Delete Panel, Aluminum, Black Hammertone" is in sale since Friday, July 15, 2016. This item is in the category "eBay Motors\Parts & Accessories\Car & Truck Parts\Suspension & Steering\Control Arms & Parts". The seller is "bmr_suspension_inc" and is located in Seffner, Florida.